In today’s business world, quality management is a key competitive issue. The delivery of products and services that meet specifications and are “fit for purpose” has become a basic requirement of customers. However, customers increasingly want much more than basic quality. 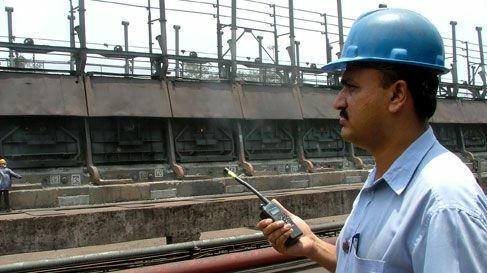 To meet these higher expectations there are tools, techniques and methodologies, which when integrated together are powerful drivers of organisational change. 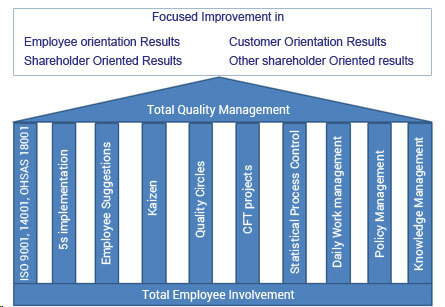 Total Quality Management (TQM) provides this integrated approach. When applied, with strong leadership support, TQM leads to continuous improvement in managements systems, processes, products and services, and results in delighted customers and stakeholders. 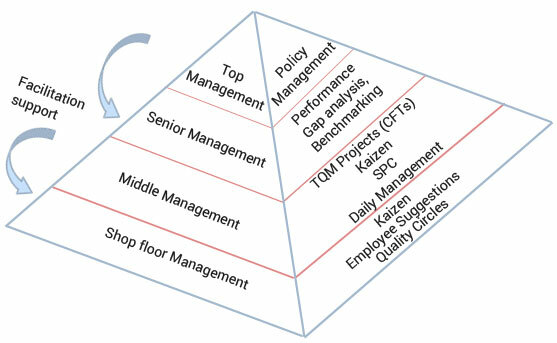 Though 5 S & other management systems (ISO 9001, ISO 14001 and OHSAS 18001) implementation are not mentioned in the pyramid above, but everybody in the organization is to be involved.